Drive four hours east of Vancouver, or five hours northeast of Seattle, and you arrive in Kelowna, British Columbia-the heart of the 'Silicone Vineyard' of northwest Canada. 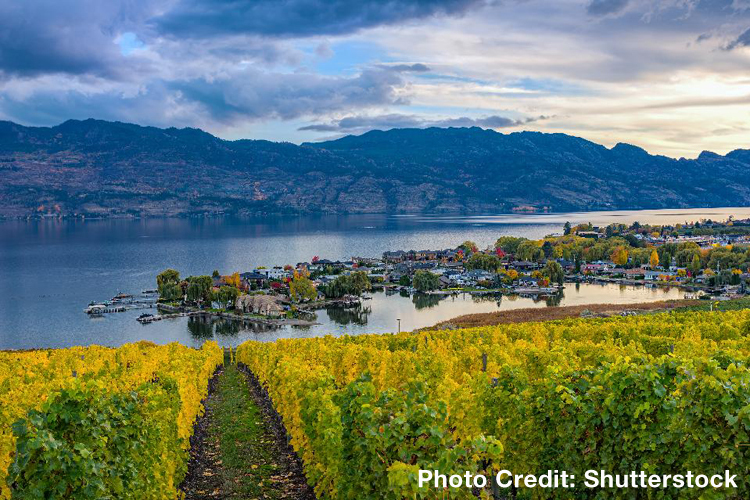 Here the surrounding Okanagan Valley includes more than 80% of wineries of all major wine producing regions in British Columbia. Because this 130 mile long valley rests in the warmth-inducing 'rain shadow' of the Cascade and Coast mountain ranges, and due to moderating effects of lake waters on surrounding temperatures, thermometers register between near freezing during winter to the 90's in July and August. Combine this relatively warm climate with alluvial sediments dumped by shriveling glaciers almost a dozen millennia ago and the resulting environment is ideal for growing vines. According to the British Columbia Wine Institute, in the past 25 years the number of wineries in the province of British Columbia ratcheted up from 17 to 341, while the overall quantity of wine production more than quadrupled. Some 75 different grape varieties are planted on almost 10,000 acres of vineyards in the province. This growing profusion and diversity of wines led to the enactment, earlier this year, of new labeling requirements for British Columbian wines to better differentiate their origin.